Yoroi Ferry, Koami-cho (鎧の渡し小網町, Yoroi no watashi Koamicho), ca 1857 (Ansei 4). A woman in kimono holding a parasol looks at the Yoroi Ferry, visible in front of a row of warehouses in Koamicho in Tokyo’s mercantile quarter of Nihonbashi. 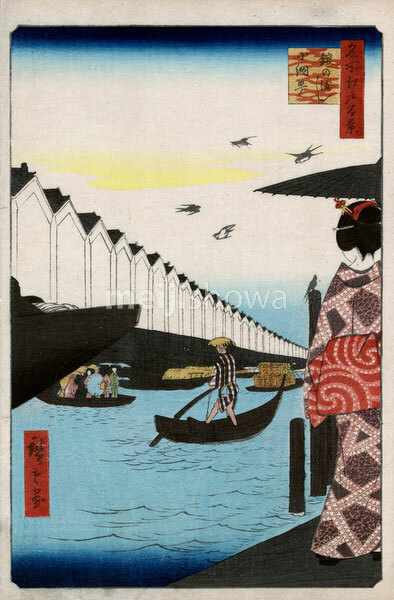 This woodblock print is the 46th image in One Hundred Famous Views of Edo (名所江戸百景, Meisho Edo Hyakkei), a series created by ukiyoe artist Utagawa Hiroshige (歌川広重, 1797–1858).